A while ago I showed you here my homemade body scrub. This time I made a new one with a few modifications, I used brown sugar and I replaced the essential oil with lemon and orange. It prepares very simple: add to blender the slices of lemons and the slice of orange until you obtain a paste then add the oils and the sugar. This is what I got and it smells delicious. Και υποθέτω πως πρέπει να μυρίζει κ' υπέροχα!!! Σίγουρα θα δοκιμάσω κ' αυτό που πρότεινες εσύ!!! I will try it! Thanks for sharing! Love it, thanks for sharing!!! Fresh has a scrub that smells great but it would proably be a lot cheaper if I made my own. will definitely try this when i have the time! Glad you like it and you,ll try it. btw wanna follow each other? Just let me know.. I would love to follow each other :) nice blog! Thanks Catherine!! Your blog is great also!! This is awesome, I'll definitely be trying this at home! Thanks Berni!!! Glad you like it. followed you back! :) Thanks ! Thanks for the tip! 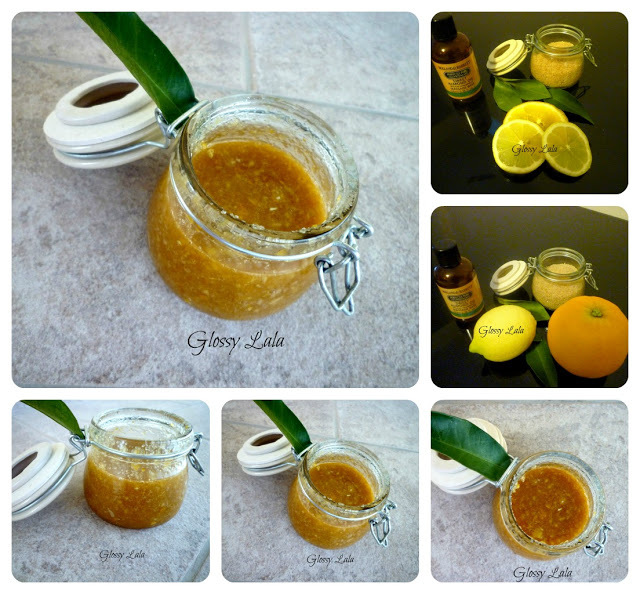 Very helpfull since i love home made beauty products! great idea and your blog is so cute! thanks for your comment on my blog, i follow you, and you?